It’s always funny hearing about the debates and controversies within the Unicode Consortium. This is the non-profit organisation that coordinates the development of Unicode—the standard that defines basically all our text on the web and on our PCs. It is funny until you realise just how important the Unicode Standard is. It’s our new printed-word language, and many people don’t want to see it degrade in a similar way to how linguistic prescriptivists don’t want to see slang terms and neologisms added to dictionaries. Furthermore many contemporary writers are now using Unicode symbols and emojis within their writing, so the emojis they have access to will influence their writing and the ultimate direction of the literary world to an extent. Hence you can imagine the controversy surrounding one of the current new emojis under proposal: the frowning-poop emoji. 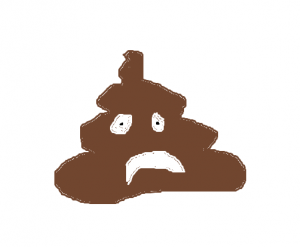 It’s not just a poop emoji—that may actually be useful—it’s a frowning poop emoji. It raises a lot of questions, like what is the actual purpose of this? And, what does a frowning poop mean? Do We Want To See Poop Within Our Text? Should We Really Be Creating Unicode Swear Words? This is one position on the issue and probably the most conservative. Some feel that there is an indecency and an unappealing quality in including faeces as a word within our digital lexicon. Furthermore, isn’t this a swear word? In creating a poop emoji, aren’t we creating a new synonym for sht or crp and doesn’t this fly in the face of traditional values? “Organic waste isn’t cute” writes frowning-emoji opposer Michael Everson. This opinion is that emojis must be cute. I understand that they must have a certain style for consistency, and this must be one that is legible in small sizes, but it will be interesting to see whether emojis continue to be exclusively cute into the future. Personally, I don’t agree with this particular argument and feel that swear words, as well as words for unappealing things have a legitimate usage in language. We need to be able to express unappealing things that exist in reality. So the original poop emoji (💩) is acceptable. This isn’t to say that the frowning-poop emoji is in the clear though…. What Does A Frowning-Poop Mean Exactly? This is the most valid, clear contention at the heart of the frowning-poop emoji debate, and you will quickly see it decent into philosophy. First politics, now yes, Unicode frowning-poop emoji philosophy. The 12-page proposal for the frowning-poop emoji explains "For instance, if someone wants to share whether they had a healthy versus unpleasant bowel movement (particularly in the context of travel or gastrointestinal health), the smiling poo is limited and may not always be suitable." Is this overly-specific? It begs the question: how many emojis should we create? Typographer Michael Everson of the Unicode Consortium is one of the most outspoken opposers to the frowning-poop emoji, and he responds: "Will we have a CRYING PILE OF POO next?" He continues: "PILE OF POO WITH TONGUE STICKING OUT? PILE OF POO WITH QUESTION MARKS FOR EYES? PILE OF POO WITH KARAOKE MIC? Will we have to encode a neutral FACELESS PILE OF POO?" Everson sounds to be of the more conservative standing within the Unicode Consortium that posed resistance to other ambiguous emojis including the Face Without Mouth (😶). The philosophical issue here is: should we make emojis with an intended purpose or, allow the writer to designate purpose to emojis when they use them? This is the old prescriptivism versus descriptivism debate of linguistics that we are back to. Basically, people will use emojis however they want anyway, but how purposeful versus interpretable should we make them in the first place? I think that we have to take a position somewhere between a basic smiley face (😊) and a wishy-washy blur of colours. The frowning-poop seems to be too far into the interpretable side for my liking. It doesn’t exist in reality and it doesn’t represent an emotion. How Many Emojis Do We Need? Finally we need to address Everson’s slippery slope argument that continues….“[a] PILE OF POO WITH LOOK OF TRIUMPH, PILE OF POO SCREAMING IN FEAR [?]”. How many emojis should Unicode create? There are currently 239 emojis, and this number has exploded since 2015. The problem with adding emojis is that fonts need to ‘support’ the emojis in order for the viewer to see them. For instance, this exploding head (🤪) has got limited font support so far, so you probably won’t be able to see it. For each new emoji, a lot of work needs to be put in by a lot of parties, so it is very different to the casual way that a new word gets adopted in a spoken language. For this reason, we should be limiting the emojis we create to things that are actually relatable and important. This means that Unicode shouldn’t include emojis that are this specific. Starting to create different emojis for every combination of thing and emotion e.g. ‘smiling face with horns’ (😈) and ‘angry face with horns’ (👿) is the first steps towards a momentous effort with no clear benefit. The frowning-poop emoji is just too random and silly for me, I have no idea how it even got this far to be honest.